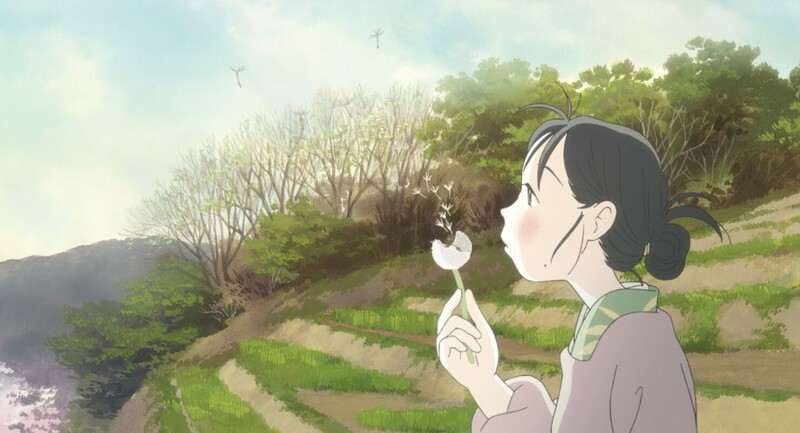 “In this Corner of the World” is about a woman who learns to love a life she never anticipated having, during a time that many would consider to be very bleak period in time. She is a simple woman, short and plain looking. She has few skills that would make her a good wife, but she will do her choirs with a smile on her face. Her one talent is drawing, which she uses as both a means of escaping the trivialities of life as well as capturing the small beauties of it. In another lifetime, she may have been a good storyteller, but the year is 1941, and Japan is at war with the rest of the world. Supplies are hard to come by and the Japanese people don’t have the luxury to follow dreams. Suzu Urano is in such a position herself. In her youth, she was praised for her artwork, had a loving family, and had a crush on a local boy who was aloof to her feelings. This sounds like it could be the story to just about any live action drama about World War II, but many will be surprised that what I have just described is a summery for an animated film. It is a beautiful film. One that looks like a sketchbook drawing that has come to life, and feathers many other forms of animation to show off our main heroin’s talents as an artist. The subject matter is not something most would think of for this format (and there will undoubtly be parents who bring their kids to see it thinking it’s a mere children’s film), and chances are some of the culture characteristics will throw off some, but “In this Corner of the World” not only embraces the format with which it decided to tell its story; it also gives us a splendid example of how effectively artists tools can be when used by storytellers. As people who have seen a Pixar film can tell you (and I’m sure many people have seen one of those movies), color can be a great tool for visual storytelling. It was used to great effect in “The Wizard of Oz” and “Gone with the Wind” before it become a standard practice in Hollywood (to the point where most movies don’t utilize it at all despite having it). That is not the case here though, as the artists use diverse kinds of paint, tones, and cosmic settings throughout the entire film, perfectly illustrating the emotional journey our lead protagonist is feeling and experiencing. 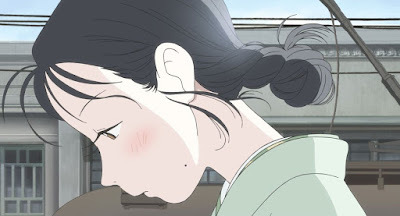 The pacing of the movie is also done in a way that we feel like we are living life with her, not merely waiting for something big to happen (though people who are familiar with important dates in history will know that disaster is about to strike). 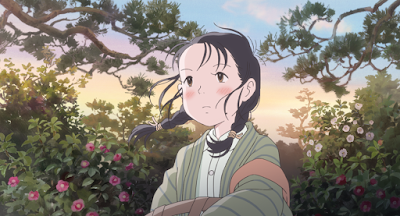 The films themes of family honor, sacrificing personal happiness, and duty to the country may not be as strong in America as they are in Japan, but the film perfectly manages to make us understand Suzu’s journey and emphasize with her so that cultural barriers are not…well, barriers to understanding what is going on. Japan has been in a bit of a mature storytelling renaissance with these types of personal stories, and thankfully audiences seem to be embracing them. 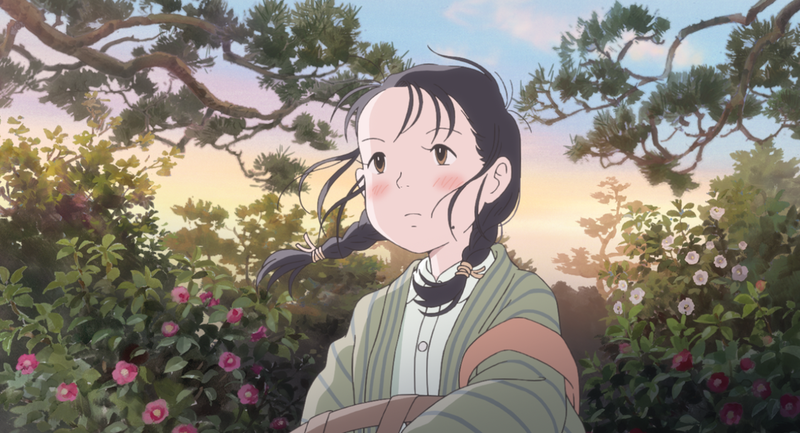 A few years ago, Hayao Miyazaki released “The Wind Rises” to critical acclaim, and this year “Your Name” became the highest grossing film in Japan and a worldwide hit. Both these movies lack the mainstream touch that normally points to obvious success, but the fact that audiences and critics embraced them none-the-less shows that there is a hunger for more mature animation on the market. Maybe more than even I realized. This was based off a comic book of the same name. That series was well reviewed, but financially not very successful. Getting the rights to it was easy but getting the funding to make a movie was difficult. Therefore, the director had to turn to crowdfunding and ask (maybe in vein) for ¥ 20 million. He managed to raise ¥ 39 million, and the result is that we have this wonderfully sensitive and touching movie in front of us. So, while I normally rag on the everyday common folk not turning up to see a movie like this in theaters, at the very least they helped it get made this time around. I’m not sure if that is going to result in ticket sales, but at least the public met the film makers halfway this time around. 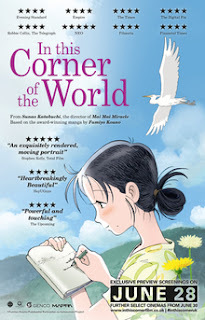 Which is really everyone’s blessing, because we need more movies like “In this Corner of the World.” Not just animated ones, but live ones too. We need movies where characters lives are so beautifully and dramatically depicted, so fully fleshed out, that we feel we know them as real people at the end of the film. That type of movie is very rare, but they tend to be the best kind made. Parents, there are several scenes of strong, graphic war violence, as well as some mature themes. Recommended for ages 13 and up.